During traditional times, Aboriginal people showed an ingenious mastery of physics to create hunting equipment and labour-saving tools. They demonstrated knowledge of chemistry, held a deep understanding of biology through powerful observation and using all the senses to predict and hypothesis. Additionally, they were competent at testing through trial and error, making adaptations and retesting to achieve a final result. Aboriginal people were experts at reading signs signalling seasonal changes and life cycles. They understood that the entire environment around them was intertwined and depended on careful stewardship of their custodial area to survive and thrive. Traditional knowledge held by Aboriginal people demonstrated an ingenious mastery and deep understanding of Biology and Chemistry. From generations of knowledge passed down orally, they invented labour-saving tools and techniques aimed at making food gathering easier. The rainforest people knew how to make multiple uses of plants such as the buttress roots of the fig tree, lawyer cane, seeds, palms and vines. For example, they were able to understand that grinding toxic seeds on the morah stone would break down cell membranes and when put in running water the toxins would leach out. They discovered that heating up toxic seeds would also break down cell membranes and remove the poison. The Aboriginal people of the rainforest invented the bicornual basket to act as a sieve for the ground seeds. They knew that placing the basket in running water, loaded with the ground seeds, the toxins would leach out. The cleverly woven basket could stay for days at a time in the water without disintegrating because of the vine’s strength. These baskets made from lawyer cane, Calamus caryotoides, which is a prickly climbing vine were ergonomically designed to endure and withstand many functions. The rainforest is a veritable supermarket, abundant in plant and animal food sources. Aboriginal people of the rainforest used their spearthrowers, firesticks, morah stones, nutstones, bicornual baskets and ooyurka stones to make hunting and the preparation of food easier. The spear thrower (also called a woomera) is used with a spear. It acts as a lever to project the spear with force and speed. This enabled the thrower to increase the spear’s trajectory over a longer distance. The bicornual basket has an ergonomical design. 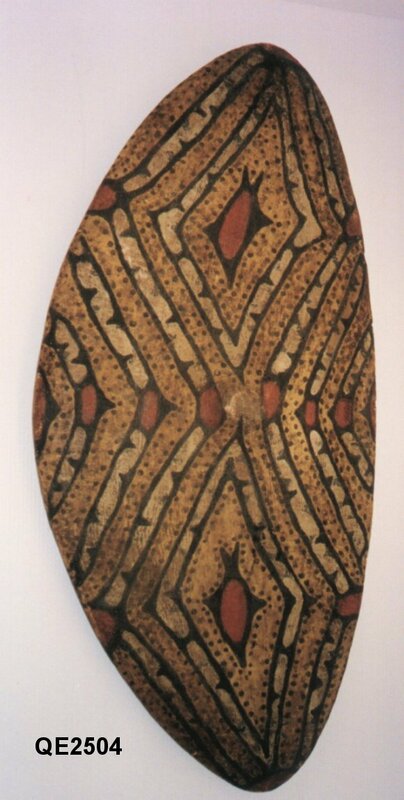 The Aboriginal people of the rainforest designed it to fit securely and comfortably on their back whilst the handle part is hung from the forehead. From this position, the basket user could carry a controlled weight easily while having their hands free. 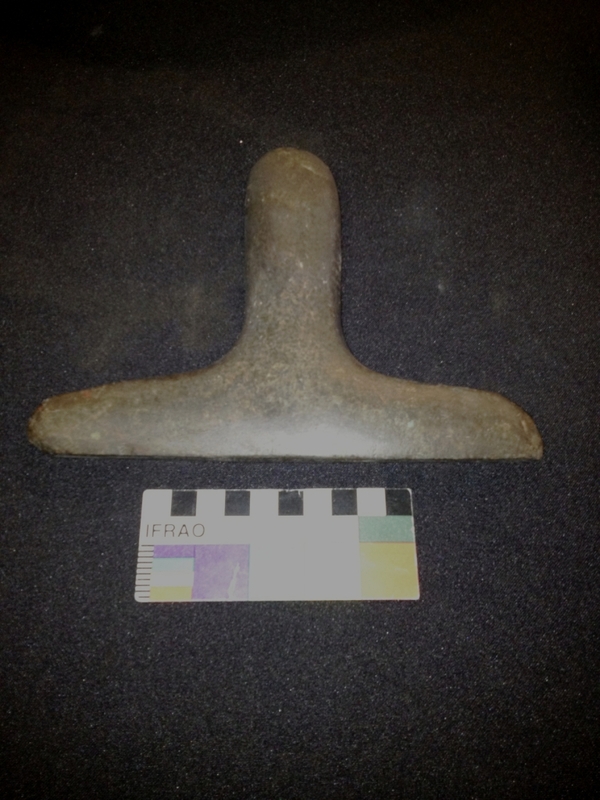 The t-shaped ooyurka stone was designed as a scraper and was used with a push and pull motion to remove seed residue from the morah stone. It was also used to make a groove in a stone axe head and could be bound easily with twine. The nut stone was designed to make cracking open the hard exterior of nuts easier. The grooves etched in the nutstone allowed less force to be exerted. Firesticks usually consisted of two long drill sticks and a case that protected the drill parts. The firemaker would use friction between the two drill sticks to make heat and a fire would result. The Rainforest people built strong shelters made with lawyer cane, fan palm leaves, blady grass, rushes and barks. Knowledge of tight weaving and thatching handed down through generations gave them the skills to waterproof their shelters against heavy tropical rains. Inside the shelters the people kept their precious shields, swords, baskets, axes, firesticks, ochre, boomerangs. Outside sat morah stones and nut-stones. For many generations this lifestyle was maintained. Without this deep scientific knowledge and understanding, Aboriginal people would not have survived for thousands of years.